The A Whale oil skimming vessel has gotten a lot of publicity over the past week or so since it has arrived in the Gulf of Mexico. During the past couple of test runs by the A Whale skimmer, the ship has not been able to capture oil effectively, which is causing some to think that the A Whale skimmer vessel is just not going to work out as planned. One of the main causes for the A Whale oil skimmer not being able to skim and process oil from the gulf effectively is because the long, thin slots on the front are capturing the oil from the waters. 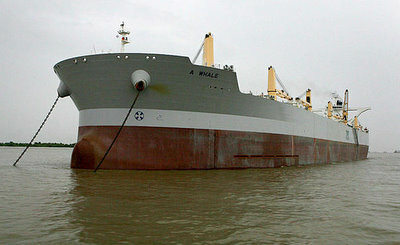 The A Whale vessel captures oil by skimming it from the water through thin slots on both sides of the front of the ship. The problem is that the gulf waters are rough, and the water level is in constant flux, thus not allowing the skimmer ship to capture the oil through the fixed slots on the front. "…the long, thin slots on the front are capturing the oil from the waters." "…thus not allowing the skimmer ship to capture the oil through the fixed slots on the front." WELL, IS OIL BEING CAPTURED OR IS IT NOT? Not to mention all the chemical dilution. Surely that does not help at all with skimming and separation.